So, that was weird. Suddenly, out of nowhere, the opengl sample I was working on for native client stopped working. So I backed out of my code. Still didn't work. Checked my other samples. They didn't work either. Looked at Assaf's Ogre3D sample. Even it didn't work. Started checking my flags and browser settings. Everything looked hunky dory. Turns out that when you're subscribed to the Chrome developer channel, your version of Chrome will auto-update to whatever the latest offering in the channel is. And it turns out that to keep up with changes in the API, Chrome changed. Normally useful and good for security, but a problem when I'm developing - if Chrome silently updates itself behind the scenes, with breaking changes, I'm going to assume it was something I did. So - is there a way to turn it off? No. BUT - I can use Chromium, the open-source sibling of Chrome - its build history is kept on line here. The version I wanted was here - the file I was looking for was chrome-win32.zip. After unzipping that into a Chromium directory in my root I was able to work again. So I'm going to stick with Chromium builds from here out, until I'm done working with Google classes that have the "_dev" suffix. 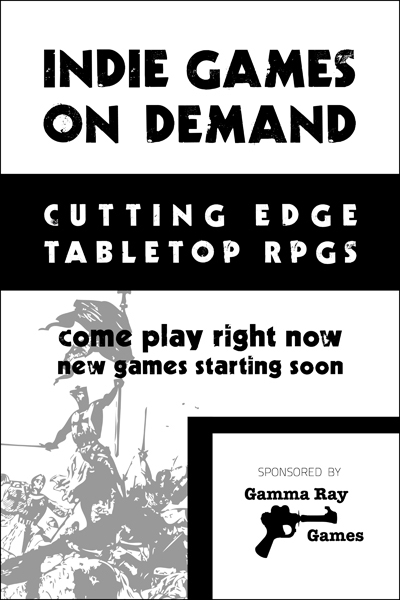 Hey, if you're going to PAX, there's going to be a room (Room 306) set aside for those cutting-edge indie tabletop RPG's I've been on about lately. I'll be there most of Saturday & Sunday - come find me and get in on one of my games. Why are these games so cool, again? I'll be ready to run Geiger Counter (survival horror), the award-winning Fiasco (the "Cohen brothers movie game" - real actors and television producers play this one! ), In a Wicked Age (bronze age face stabbing), Love in the Time of Seid (no dice!?! ), or Lady Blackbird (steampunk action adventure). Come and join us. Hey, you web developers: where do I start? And ... start on my Windows machine? Run a different OS with VMWare? Or just start coding on my hosted box or cloud instance? This "simple_font.cc" under-development example of using fonts is in the Chrome sources. I'm lucky I found it. It was surprisngly easy to take the image data and make it into a gl texture and continue to do everything with the 3d client - I'm guessing a 2d client and 3d client wouldn't play well together, but didn't actually try it. So far it's slow, though - I seem to be spending about ~20 msec on text alone - not sure how much of that is drawing the text and how much is uploading the texture - I'll do some profiling soon - and I haven't tried glMapTexSubImage2D() yet, from these tips. Sometimes I'll write some code that crashes my game in Native Client and changing the code back doesn't help. It seems that Chrome can be made somehow unstable when a crash occurs - I'm not sure exactly what the voodoo is, but shutting down Chrome and then going into the Windows task manager and ending the GoogleCrashHandler process makes things all better. It wasn't immediately obvious how to get my game running at a real framerate - the main thread needs to handle messages from the browser, and it does this by overriding a handle message call in the Instance class - unlike a good old Petzold-style windows app which can process the message queue on its own terms. Bottom line, you need to give up control of the main thread so the Pepper API can do its thing. So, I should put my game on another thread, right? Well, so far, the Pepper API isn't happy about being called from other threads. And the GL stuff doesn't seem to support moving the gl context from one thread to another a la wGLMakeCurrent yet. And now we've got some speed going! A little work, and you could start logic updating before the swap is finished, for more more speed. I have a cross-platform build - since there's no debugger for Native Client yet, I made sure to keep the program I'm porting still running under windows, so I can still debug the bulk of my code. I haven't figured out the voodoo that makes Chrome decide whether it's going to use the .nexe from the cache or a new one. So the first thing my program logs is __DATE__ and __TIME__, so I can make sure the program it's running is indeed the one I just built. And if it's not I clear the cache. Version control. If I introduce a bug that has me tearing my hair out, I can go back to a previous version. I have to remember to check in often! Fiasco won this year's Diana Jones Award for Excellence in Gaming. (The Diana Jones Award, I just discovered, has nothing to do with the author Diana Wynne Jones. Huh.) I'd just like to say, good choice! The mechanics are incredibly simple, mostly boiling down to choosing black and white dice (effectively stones, as faces don't matter during conflict resolution) to decide how scenes resolve. The epitome of "rules-light", and the opposite of recent editions of Dungeons & Dragons. Where a lot of "game master-less" games actually have a rotating game master, expecting every player at the table to be able to do that nebulous stuff a game master does, Fiasco distributes the role - in particular, with the "scene framing" role of the GM. Fiasco's main rule is - on your turn, you either frame your scene, in which case the other players get to say how it turns out, or you let the other players frame your scene, in which case you get to say. So somebody uncomfortable with making up a scene never has to do it. So with such light rules, how do you decide what happens? I've found when I play it comes down to a mix of voting using the dice, and following the fiction. In other words - "karma" and verisimilitude. Sometimes you want to see a character get hurt because it makes sense for the moral of the story; sometimes you want to see a character get hurt because it makes sense from what's happened so far in the fiction. It is great for newbies. I've played it with people who have never roleplayed before (including my dad, age 74), people who couldn't care less about the difference between D&D's standard and full-round actions, and seen them shine as improvisational actors and storytellers. During development, you obviously don't need to build every target every time - so why make your build 4x longer? If anyone knows the scons magic, could you tell me what it is? Then I'll update this post.